Anyone flying from the New York area to Miami has several choices of airlines and airports. It’s an easy flight—about 1000 miles in distance and about three hours from gate to gate. Depending on the most convenient departure time, airport and competitive pricing, flyers can choose direct flights from Delta, American, United and Frontier Airlines. We chose Delta Flight 1711 out of LaGuardia (LGA), primarily because we wanted to take advantage of expiring SkyMiles. We intended to book two Delta Comfort Plus seats for the extra legroom. As it turned out, we did an involuntary controlled clinical trial because when my husband and I booked our tickets, only one seat was available in Comfort Plus. Thus, one of us sat in Comfort Plus and the other (me) in an aisle seat in the 35th row in Economy. The multi-year renovation of LaGuardia (which has often called a third-world airport) has been daunting for travelers and commuters. There are tales of traffic backups that make air passengers trek long distances in the snow to catch flights. We were lucky on two accounts: There was no snow on the day of our departure and traffic on that Friday morning happened to be light. We were also worried about the potential impact of President Trump’s U.S. government shutdown. There were news reports that many TSA agents were calling in sick because they weren’t being paid. Again, we were fortunate. The TSA lines at LaGuardia were less than five minutes long and airport staff seemed to be in full force at their posts. Our narrow-body, 192-passenger plane had a First-Class cabin; a limited number of Delta Comfort Plus seats (with extra legroom, Sky Priority Boarding and upgraded snacks and drinks); Preferred Seating (located towards the front of the economy cabin for an extra charge); and seats in Economy (euphemistically called the Main Cabin). The Airbus A321-200 was newish-enough and looked like it had all the bells and whistles. Except for the seats in first-class, the other cabins (including Comfort Plus) were configured with three seats on each side of the aisle. With decent padding, all these seats were comfortable and offered ample legroom for a short haul flight. Legroom in the economy seats was 30” and in Comfort Plus 33”. I lucked out again. The middle seat beside mine was unsold making the flight comfortable. Service and snacks between the two types of seating were comparable. Thus, the major advantages offered by Comfort Plus were that it offered priority boarding and quicker egress from the aircraft. Delta offers complimentary entertainment including newly released movies, TV shows, music, games and more that can either be streamed to a personal device or watched on the seatback free of charge (except for the $2 fee Delta charges in Economy for headphones if you don’t bring your own). However, the live Dish TV wasn’t available on our particular flight. Inflight paid Wi-Fi also wasn’t available. When it is available, passengers also have the option of connecting to three messaging services—iMessage, Facebook Messenger, and WhatsApp—free of charge. Because my husband’s seat in Comfort Plus (10A) was directly behind First Class, he had no personal entertainment system (except for Sky magazine and an overhead screen operated by the crew, primarily for safety announcements. In both Economy and Comfort Plus, the airline provided a choice of a light snack (Bischoff cookies, peanuts, a Kind bar or snack mix) and complimentary soft drink/juice/coffee—or cocktails and wine available for purchase at $9, and beer at $8. The flight crew was professional and communicative. We were delayed in takeoff because the crew arrived late and then again when we had to wait in line for takeoff. However, one lapse: It seemed that no effort was made to inspect the lavatory or clean it up in flight. The lavatory also hosted the world’s smallest sink. See size of faucet in relation to basin. Bottom line: Is Delta Comfort Plus worthwhile on a domestic flight? Despite the lack of sufficient seating at the terminal at LGA, the delays in takeoff, the filthy lavatory and our disappointment in not being able to get two seats together, we would have no problem booking the same Delta flight again. The landing in Miami was smooth and easy. However, like most airlines, a few things made us feel nickel-and-dimed: having to pay for a first checked bag, having to pay for earphones (in Economy), etc. But such is the state of air travel these days. We are usually staunch proponents of purchasing extra legroom for over-50 travelers if the cost isn’t prohibitive, especially on long-haul flights. This is one measure travelers can take to help prevent deep vein thrombosis (DVT). I previously praised our Delta Comfort Plus+ experience on an international flight. Our conclusion: In the case of a short domestic flight like the one from New York to Miami, the difference in legroom between economy and Comfort Plus is negligible, only 3” inches, and doesn’t seem worth the extra cost (in miles or cash). However, It might be more worthwhile for someone who is extremely tall. 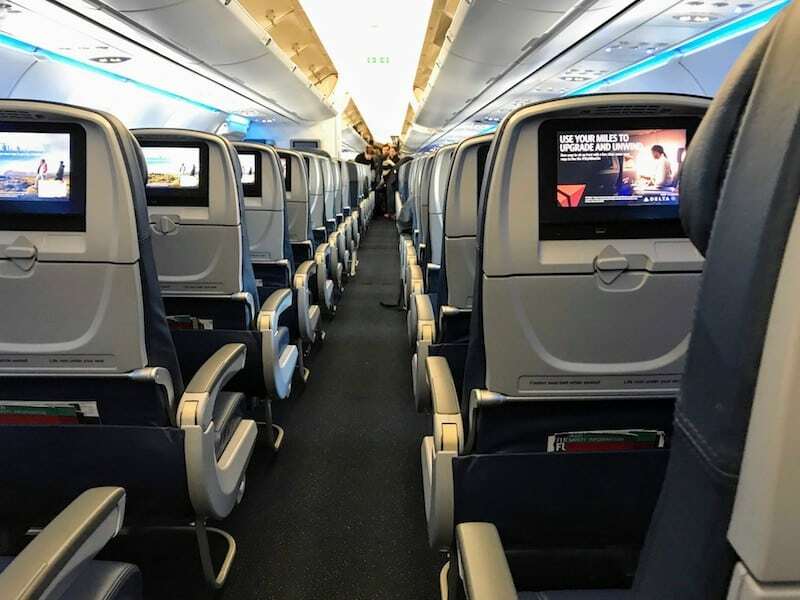 Another post on MoreTimeToTravel describes an international flight on Delta Comfort Plus. This is one of a series of posts about our airline experiences. Surely, each flight is different but it’s always helpful to get general impressions of what to expect before you fly. If you fly Delta Comfort Plus domestically and have a very different experience, please feel free to comment below. What is it like to fly Delta+? Appreciated this piece on flying Delta–that’s the airline I seem to fly on the most. The newish Airbus sounds nice. Also, was interested to read about your recent Laguardia experience. I’ve been avoiding that always-under-construction airport like the plague, but will have to use it for a flight to Florida in about a month. Fingers crossed that the whole U.S. aviation system hasn’t fallen apart by then! The traffic tie-ups at LaGuardia seem to be sporadic and unpredictable. Hope the government shut-down is over by then! To quote you: ” we wanted to take advantage of expiring SkyMiles.” Skymiles do not expire. So that should not have dictated your choice of airline. You are correct. According to the Delta website: Under the SkyMiles Mileage Expiration policy, miles do not expire. But I was eager to find a way to use those miles since it isn’t always easy! Thanks for your comment. The only reason I’ve paid for Comfort+ for our upcoming flight is to be closer to the center of the plane. Had originally booked on a Boeing 717 in row 17 3 weeks ago which put us slightly forward of the wings (air sickness no fun). This weekend I was checking for flight time changes before booking our rental car when I realized they had switched us to an Airbus 320 with our seats in row 24, which were the closest forward we could get because the other rows available was exit row and I’m traveling with a 10 year old.